- Begin by bringing water to a rapid boil. Put the noodles in the boiling water and cook until al dente. - Strain the noodles into a strainer in the sink, empty the pot of water and put it back on the stove. - Put in the butter and lightly brown it. Then add the whisked egg, and evaporated milk, and stir together well. - Season with the ground mustard, salt, and pepper. - Add in the noodles and mix well. 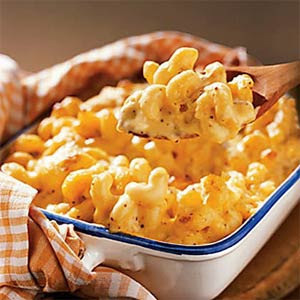 You can either serve it as Wisconsin style mac and cheese, or put it into a casserole dish and bake at 400 degrees for 15-20 minutes or until the top is lightly browned.